New adventures with CURIOUS GEORGE debut on PBS KIDS October 28-30; one of them features an original song performed by Belinda Carlisle. 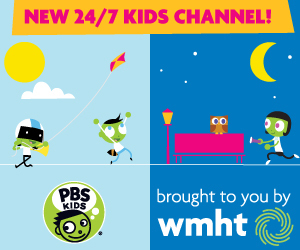 The week of Halloween will also feature Halloween-themed episodes from other PBS KIDS shows, including an encore play of CURIOUS GEORGE: A Halloween Boo Fest. 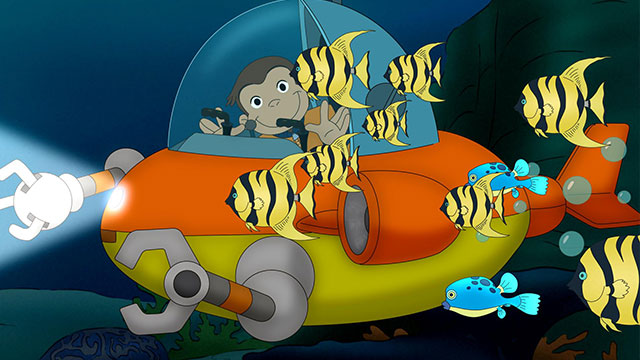 Submonkey - When Professor Pizza’s birthday present is dragged away by a strong ocean current, George volunteers to take an undersea adventure in a monkey-sized submarine to retrieve it. Can the curious little monkey locate a small package at the bottom of the ocean or will Pizza’s present be forever lost at sea? Double-Oh-Monkey Tracks Trouble - Double-Oh-Monkey takes on his most important case yet – to prevent Steve’s well-intentioned (but always disastrous) “good luck present” from ruining Betsy’s dance recital! Using his super spy skills and all five of his senses, George tracks down Steve and discovers…a bucket of wet paint?! Can George warn Betsy in time? Or will her dance recital get a splash of color? Monkey Goes Batty - A hole in the roof means George and the Man with the Yellow Hat must sleep in the living room while their bedrooms are being repaired. But their adventure quickly turns into a disaster when George’s nightly trips to the kitchen keep the Man with the Yellow Hat awake at night. Can George figure out a way to quietly find his way to the refrigerator in the dark? Curious George and the Balloon Hound - George and Hundley are amazed by all the flying machines at the museum’s aviation exhibit. So when Hundley’s souvenir airship flies out of reach in the lobby, he dreams he is British flying ace, Leftenant Doxie. Joined by the daring flyboy Chuck Monkey, the dynamic duo uses propeller power as they race towards the finish line. When Hundley awakens from his dream, he has a few new ideas on how to get his ceiling-bound toy within reach. George’s Photo Finish - Today is the big unveiling of the Ankylosaurus dinosaur skeleton at the museum, but it's missing a leg! George and the Man with the Yellow Hat thought they delivered all four bones. Where did the fourth bone go? Fortunately, Mr. Quint took pictures on their way to the museum. Maybe the photos can lead them to the bone…if they can only figure out which order to put them in. Monkey Mystery Gift - George and Allie’s imaginations run wild as they brainstorm what could be in the large unmarked box on George’s doorstep. Based on its weight, sound, smell and bristly hair, they’re certain it’s a baby goat! But what’s really inside surprises them more than anything they could ever have imagined.